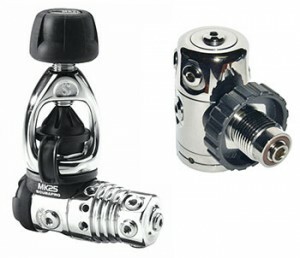 SCUBA Regulators: DIN vs. Yoke? The subject comes up in every class we teach, at dive sites and on boats. That is, which regulator to tank fitting should I choose? There are basically two that we use in SCUBA; DIN and yoke. If you are new to this then check out what is a regulator. DIN valves (Deutsches Institut für Normung) are essentially a screw-in regulator connection, where the o-ring is captured on the regulator side, rather than the tank valve. Since the fitting is more secure, DIN valves allow the use of higher pressures, and are more suitable for demanding diving situations like technical diving-especially in environments like caves or wrecks, where a bump to the valve could cause a leak. DIN connections are typically lower profile than Yoke fittings, which reduces problems with snagging on things like kelp or fishing line. It used to be that you needed to choose between Yoke or DIN when selecting SCUBA cylinders, because the two are not interchangeable. However, a number of manufacturers like OMS now make SCUBA tank valves that can be converted between yoke and DIN with an insert that is removed or replaced with an allen wrench. These are frequently used on steel tanks rated at 3442 psi, and occasionally on aluminum 80’s and others rated 3000 psi. It is basically a standard “K” type valve, so it’s a good option for those with yoke-type regulators who might make a switch later, or who have both. DIN valves are rated in atmospheres, or Bars. Well, that’s not exactly true. 1 atm (atmosphere) = 1.01325 bar, but it doesn’t matter much to divers anyway. What matters is there are 200 Bar and 300 Bar DIN fittings. 200 Bar DIN fittings are used with those convertible valves I mentioned earlier. High pressure, 3500 psi cylinders, like the Sherwood Genesis SCUBA tanks that kind of started the DIN thing in the U.S. are 300 Bar. You can’t use a 200 Bar regulator with a 300 Bar cylinder valve, but a 300 Bar regulator fitting will work with 200 Bar valves. For this reason, it makes sense for your regulator to be equipped with a 300 Bar connection regardless of which tank you’ll be using. Along those lines, there are adaptors that convert DIN regulators to work with a standard yoke valve, so you can use the same regulator at home and when traveling. The bottom line is for most divers, it doesn’t make much difference. But, as the sport continues to evolve, and as most divers grow, DIN makes more and more sense. It is unquestionably a more secure and durable connection, and in my opinion, the only choice for technical diving. Since there isn’t much difference, if any, in cost, when selecting a regulator, a DIN fitting plus an adaptor makes sense. Sometimes the adaptor is included. It depends on the manufacturer. Either way, it’s worth considering. This entry was posted in New Dive Gear, SCUBA Instruction, Technical Diving and tagged dive gear, diving equipment, reguator, scuba cylinder, scuba equipment, tec gear, tech gear.